This is the City of Temples; and not without reason - after all it is home to some of the most extravagantly crafted temples that make Kanchipuram one of India's seven sacred cities! Kanchi was once the city of a thousand temples, though very few remain today. This city was once the capital of the ancient Pallavas, Cholas and the Vijaynagar Empire. The temples that remain are exquisitely carved and emanate a sense of mystery when you enter. Each temple has a distinct story and each locality has at least one temple! These temples are architecturally quite similar - with protruding triangle-like vimanas and elaborate gopurams or gateways. We recommend setting aside at least three days to explore Kanchi. And if you need to do something different than visiting temples, don't forget to pick up its exotic hand-woven silk fabrics that are the finest you can lay your hands on. Clothing: Comfortable cotton during summers & light woolen during winters. Remember short and inappropriate clothing aren't allowed within the temple, so pack your bags accordingly. Moving Around: Within the city, bicycles are available for hire at extremely low prices. Cycle Rickshaws as well as auto rickshaws are available for travelling in the city. Sri Ekambareswarar Temple: Dedicated to Lord Shiva in the form of Prithvilingam, this is one the largest and most popular temple in Kanchipuram. Sprawling across a huge area, its striking features include the 57 metres high gopuram and the massive outer stone wall. The temple has five spacious corridors and an intricately carved 1000-pillared hall. The inner walls are adorned with 1008 Shiva lingams. The courtyard has a 3500 years old mango tree, whose branches are believed to yield four different varieties of mangoes! Sri Kamakshi Amman Temple: Dedicated to Parvati in the form of Kamakshi, this temple is the site of the famous annual Car Festival in February or March when the Goddess is taken out on a procession throughout the town. The sanctum is located beneath the gold-plated vimana, situated within the Gayatri Mandapam, and supported by 24 pillars coordinating with the 24 letters of the Gayatri Mantra. Within it sits the main deity holding a sugarcane bow, noose, staff and flower arrows in her hands. The temple also has a shrine dedicated to Adi Sankaracharya, who placed a chakra before the main idol. Outside the main temple is a mango tree beneath which Kamakshi is believed to have worshipped a Shivalingam made of sand and gained Shiva's hand in marriage. Important - Men need to remove their shirts to enter the Gayatri Mandapam. Cameras and mobile phone are not permitted within the sanctum. Sri Kailasanathar Temple: Another temple to Lord Shiva, it is noted for its unique construction in red sandstone. The main shrine is bound by 58 smaller shrines and its walls are adorned with sculptures and fresco-style paintings. This is undoubtedly one of the simplest temples and lacks ornamentation in any form. The only decoration you are likely to see is the sculpted walls with images of Shiva in various forms and postures, Parvati and lions. Sri Varadaraja Perumal Temple: This temple is another attraction in Kanchipuram. It is dedicated to Vishnu and is located atop the Hastigiri or Elephant Hill. The main deity is known as Varadaraja Perumal and stands atop the hill. The temple is sculpturally rich with carvings of riders on horsebacks and carved lizards plated in gold. In fact, don't miss the twin lizards crafted in gold and silver that promise to annul the sins of those who touch them. Its most striking features are the 100-pillared hall carved out of a monolith, complete with carvings of horse-riders and ornamental rings also carved out of a single stone at the four corners. The 16th century pillared pavilion is also found in this temple. The deity as Attivaradar is carved out of atti wood and enshrined within the temple tank. He is brought out once before the public once every 40 years for 48 days. Celebrated with great show and attended by thousands here is the annual Garudothsavam Festival between May and June. Sri Ulagalanda Perumal Temple: Dedicated to the Trivikrama form of Vishnu, the main idol is 35 feet high and 24 feet wide posing with one foot on the earth and the other on the sky. Sri Vaikunda Perumal Temple: Another Vaishnava Temple, the temple is well-known for its sculptures and inscriptions. Its inner walls are completely decorated in lion-shaped pillars, which are believed to be forerunners of the 1000-pillared halls in later temples. Sri Kacchapaeswarar Temple: Dedicated to Lord Shiva, a unique feature of this temple is the idol of Lord Shiva being worshipped by Vishnu in the form of a turtle. Sri Vijayaraghava Perumal Temple: This temple is believed to be the spot where Lord Rama performed the funeral rites for Jatayu, the bird. Jain Temples: Located at Tirupparuthikkundram, these two 9th century shrines were built for the Jain Tirthankaras. Out of these, one remains inaccessible and the other is adorned with frescoes and a huge image of the Mahavira. Sri Subramaniya Swami Temple: A must-visit temple for Hindus, the location of this temple within the city makes it extremely significant and is even mentioned in the Hindu scriptures. This temple is also known for the 'Soma Skandha' posture in which Lord Shiva has Goddess Shakthi to his left and their son Lord Subramanya seated between them. Vedantangal Bird Sanctuary: One of the best and most renowned water bird sanctuaries in India, the nests are usually located on the branches of submerged trees. Most commonly sighted are storks, egrets, cormorants, darter, flamingos, pelicans, moor hens, herons, kingfishers, sandpipers, white ibis, spoonbills, swans and gray wagtails are some of the birds. Visit it between October and March, when a large number of migratory birds bring life to this sanctuary. Muttukkadu Lake: Located almost 80 kms from Kanchipuram, this lake is created out of the backwaters and are abundant in boating and wind surfing facilities. Kanchi Kudil: A perfect example to experience the life and times of the locals. Kanchi Kudil is a 90-year-old heritage house that has preserved its authentic old-world charm, typical of the ancient style of living. Also added here are descriptions on the Kanchipuram's history, traditional music and a range of handicrafts for tourists to buy as souvenirs. Anna Memorial: Kanchipuram is the birthplace of Dr. C.N. Annadurai, a scholar statesman, who was affectionately called Anna (elder brother). His ancestral house today has been converted into a memorial. Land of the delicious idli, dosa, sambar and rasam the vegetarian fare here is quite a delight. Tamilian's staple diet is steamed rice along with grains, lentils and vegetables laden with spices for that distinctive taste. A safe bet would be Hotel Sarvana Bhavan and Sarvana Lunch Home on Gandhi Road, which are moderately priced restaurants serving delicious South Indian food, especially dosas, accompanied with quick service. One of the best places in town is the restaurant at the Hotel Baboo Soorya, East Raja St. which serves south as well as north Indian vegetarian food. Visit the Geetham Restaurant with its glass roof top that serves an excellent selection of north Indian and tandoori cuisine. For some light breakfast, head out to Hotel Abirami and Hotel Sakthi Ganapathi or even Sridhar CafÃ©. In case you visit the Kamakshi Amman Temple during lunch hour, you can try out the India Coffee House or Adayar Ananda Bhavan, which serve fast food items, snacks and a variety of sweets. 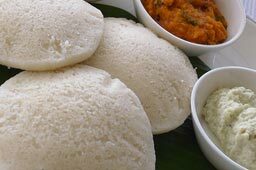 Kanchipuram is known for its Kovil Idlis, which are characterised as being large, puffy and laced with dry ginger, pepper and cumin. Of course, even this famous dish is not available as easily in Kanchipuram. In fact, only select hotels serve them at select hours and days. For instance, Sridhar CafÃ© serves these on Thursdays as evening snacks, Hotel Chakra serves these on Tuesdays at lunch time and Sarvana Lunch Home serves them on Sundays during evening. Varadaraja Perumal Temple serves a few Kanchipuram idlis as prasad but they get over very fast! So remember to inform the temple authorities at least a couple of days in advance so you can get an idli made exclusively for you! Needless to remind, Kanchipuram is known for its exquisite silk sarees hand-woven by the craftsmen. These silk saris are woven from pure mulberry silk and combine a dazzling array of colorful threads or zari (fine golden thread) into attractive patterns depicting traditional motifs. Some of the finest of silk saris and fabrics can be found at Gandhi Road and the handloom co-operatives in town, including, Prakash Silk Sarees, BM Fabrics, BM Silk Saris, Kamatchi Co-Optex and ThiruÂ­valÂ­lur Co-operative Society. One of the most reputed silk houses, with its presence in several cities in India is the Nalli Silks. Apart from silk, you can head out to buy various artifacts and handicrafts. From candle stands and jewellery boxes to idols of various Indian gods, it can all be found here! Gifts and souvenirs made of jute, bronze and copper are a good buy as well. Owing to its rich culture, there are a number of festivals celebrated that provide an insight into the history of this temple-town. One of the most important and vibrant of celebrations is the Brahmotsavam Festival held at the Varadaraja Temple in May. This 10-day festival is held in honour of Lord Varadaraja and his consorts Sridevi and Bhudevi. Attended by thousands of people from across, the 7th day marks the Car Festival, when the deities are taken in a grand procession around the city. Float Festival is also held at Varadaraja Temple in February and November. The Brahmotsavam Festival is also celebrated in the Ekambareshwarar Temple for 13-days. This festival is marked by a grand procession of the Nandi Bull and the 63 Nayanmar saints, followed by the wedding of Shiva and Parvati. The Sankara Jayanti is a 10-day festival celebrated at the Kamakshi Amman Temple between April-May. During this, the Soundaryalahari (verses of Adi Sankara on Kamakshi) are recited before the deity at around 7pm. During this, no one is allowed to enter the sanctum since it is believed that at this time it is Sankara himself who is in unity with the goddess. Navratri is another festival celebrated with great show. During this, every evening for nine days, the goddess is dressed in her fineries and jewels and taken out in procession. Another festival that's celebrated with great fervor is Mahashivaratri in February at the beautiful Kailasanatha temple and dedicated to Lord Shiva. On this auspicious day thousands of ardent devotees converge to the temple to get a view of the 6-foot lingam and offer prayers to the Lord. MM Hotels on Nellukkara Street. A fine choice we seriously recommend would be GRT Regency, part of the GRT Group of Hotels, on Gandhi Road. Air: The nearest airport is at Chennai, which is located 75 Kms away. It is connected by all major domestic carriers and some international airlines too. You can hire a taxi or luxury car from Chennai to Kanchipuram. Rail: Trains for Kanchipuram are available from Chennai, Chengalpattu, Tirupati, Pondicherry, Nagarkoil, Pune and Bangalore. Road: Kanchipuram is from Chennai and Bangalore via NH-4. Inexpensive and clean buses ply frequently buses to and from the city to Chennai, Bangalore and other places. The bus stand in Kanchipuram is located on the corner of Nellukkara St and Kamaraj St, in the center of town. Buses are also available directly to Tirupati. The Kamakshi Amman Temple is dedicated to Goddess Parvati in the form of Kamakshi (one whose eyes are full of love). It is, however, interesting to note that the famous religious leader, Adi Sankaracharya is significantly associated to its rich history. It is believed that the earlier form of Kamakshi was one of rage and fury. This was controlled by Adi Sankara by placing a divine Chakra before her, thus turning her peaceful. He also bound her by a promise that she would never leave the temple with his permission. True to this, till today, during the Utsava Kamakshi when the deity is taken out it procession, it seeks permission from Adi Sankara's shrine in the inner corridor.